I am excited for this weekend because I get to go home and spend time with my family, my aunt, uncle and sister will be here for the weekend! I also get to go to my dear friend Katie's baby shower! I think it is going to be a good one! Do any of you have big plans? Now on Tuesday I brought you three new pin recipes, check it out here if you missed them! I am here today to give you the results of those new recipes, and as my title suggest I made two out of the three, and you know what the two I made were pretty stellar! Shall we take a look at what I made? I was so hungry I forgot to snap a picture. But these green beans were delicious. Roasted with mushrooms with balsamic and parmesan cheese! The mushrooms were amazing, and the green beans weren't mushy! I served these green beans with rice and a little tofu! Perfect meatless meal! These roasted green beans also made a great salad topper! Love roasted veggies tossed in a salad! Now lets take a look at the sweet corn risotto! 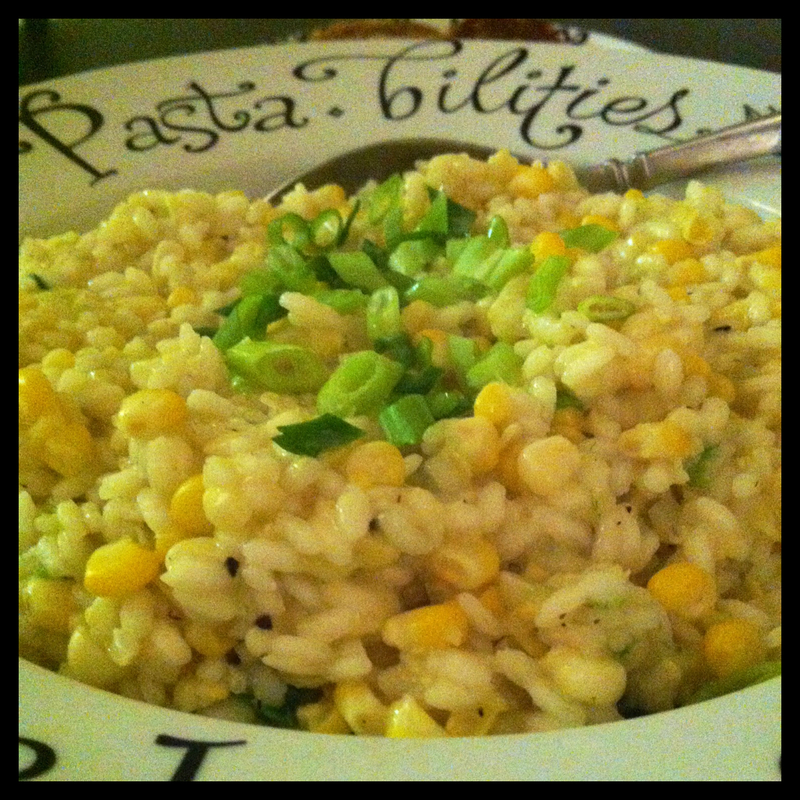 This risotto was studded with sweet corn, and the green onion added a nice flavor punch! Derek really enjoyed it! I served the risotto with these crab cakes from How Sweet It Is, easy to make and delicious! Be prepared for lots of leftovers with the risotto, but it is totally worth it! If you have some time this weekend I highly suggest trying both of these recipes! And don't worry the third recipe (for stuffed acorn squash) I am trying out Sunday or Monday. I can't let my perfectly good acorn squash go to waste! So stay tuned for my review of this stuffed acorn squash recipe. Loaded with veggies this recipe just screams fall! I hope you all have a fabulous weekend, see you all Monday! I also love roasted veggies topped on a salad! I like zucchini the best. The green bean dish looks great! Have a great weekend, Hill!